"Get off my bed. Don't you realize you're alone with a man in a hotel room?" 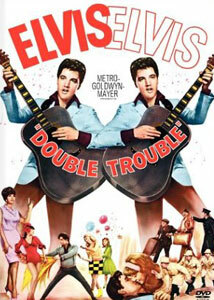 You know, looking at the cover of this DVD, and knowing that the first-tier Elvis titles have already been released, I held out the faint but persistent hope that, especially given the film's title, this would be an Elvis-Presley-as-evil-twins movie, his precursor to Dead Ringers or something. Sadly, these hopes were dashed, and what you've got here instead is a pretty mediocre late Elvis picture that gives it the old college try, but apart from the King himself, doesn't offer a whole lot of pleasures. Presley plays Guy Lambert, a nightclub singer with (a shock, I know) a way with the ladies. The lass of choice of the moment is Jill (Annette Day), a young British thing who threatens to turn herself into the old ball and chain, looking for a ring from Guy. But she's still in school, and Guy has a wandering eye, especially when it can land on Claire (Yvonne Romain), the slinky, vaguely Eurotrashy woman who professes her love for Guy's, um, talents. A wacky plot ensues, in which Guy ships out to Belgium on tour, Jill comes up with an excuse to head there too, and they both get mixed up in a ring of diamond smugglers, British country houses, and menacing European cloak-and-dagger types. The explosive energy of young Presley isn't on display here, really; but Elvis is comfortable in front of the camera, and even if every character he ever played is basically a version of himself for public consumption, he seems as at ease here as he ever was on screen. What's a little unpleasant, though, is that most of the humor is smutty, in the tackiest nudge-nudge-wink-wink kind of way. Elvis is frankly looking to get laid for most of the run of the picture, and the early Elvis of ten years previously wouldn't be saying lines like this one, when he discovers Jill's young age: "Seventeen will get me 20." Lieber and Stoller are long gone, too, and there isn't really a memorable tune on the soundtrack—it's a mark of how sloppy Colonel Parker got that we get songs here like Long Legged Girl with a Short Dress On, a long, long way from something like Baby's Let's Play House. The best cut, in fact, is a cover of Old McDonald, farm animals and all. But he's still Elvis, though, and as a magnetic performer, rises above subpar material; the plot even gives him a chance to show off some of his karate moves. At one point, Guy and Jill stow away on a ship, raising the specter of Elvis as Leo; this too is only a short-lived possibility. Of note in the supporting cast is Michael Murphy, looking a bit out of place in his screen debut, more than a decade before more notable performances in movies like The Front and especially Manhattan. Image Transfer Review: This transfer is pretty much just a dump job, with a print full of scratches, discolorations and debris. Not a visual feast, by any measure. Audio Transfer Review: Lots of hiss and buzz and ambient noise, but the music is mixed and transferred with much greater care than the dialogue scenes. Extras Review: Only an Elvis Presley trailer gallery. Even grading Presley movies on a curve, this one isn't so hot, a warmed-over plot full of smutty jokes with dollops of third-rate songs tossed in. Then again, for some of us, all Elvis is good Elvis. E-I-E-I-O.